Thanksgiving and December really sneaked up un me this year. As many others in California, we were living in unhealthy air due to the big wild fires. We tried to escape to the Sierras, and this threw my schedule way off. But now, over halfway to Christmas, I’am getting back into the game. We are going to the annual Danish Christmas lunch, and I alway make gravlax. This year I decided to make 2 different versions, the regular and a pretty red beetroot and gin version. The pretty pink gravlax is delicious too. I serve it with a dill and creme fraiche sauce. In a food processor or mini chopper, blitz together the beets , gin, and lemon zest until they become a smooth paste. Transfer the beet mixture to a small bowl and mix in the rock salt, and sugar. Rub a little mixture on to the salmon skin, then place the salmon, skin side down, in a large zip lock bag in a dish or baking tray. Pat the remaining mixture all over it so that the salmon is completely covered. Remove as much of the air from the zip lock bag as possible. Pace a little cutting board on top of the salmon, and place some weight on top to have an even pressure on it. Place in the fridge for 24 hours. After 24 hours, gently unwrap the salmon and remove the beet mixture. Gently splash the salmon with a bit of water to rinse off any remaining cure and rinse the dish too. Mix together the herb cure ingredients in a small bowl, place the salmon (skin side down) in a new zip lock bag in the dish. Cover the salmon evenly with the herb cure. Remove air and put the weight on back onto the salmon. Refrigerate for another 24 hours. The next day, your cured salmon will be ready to enjoy. The herb mixture does not need to be rinsed off- just thinly slice the salmon and serve it as an open faced sandwich, with a creme fraiche (or sour cream) with dill. These smoked salmon canapés are just perfect at any party. They are super easy to make and packed with flavor. The cucumber provides the crunch and a clean crisp taste. Make sure to make plenty, it's a crowd favorite. Mix the ingredients for the spreads together and season with salt. Scoop the spread into a piping bag and let it rest in the refrigerator for about 30 minutes, allowing the flavors to develop. Cut the cucumber into ⅓-Inch (1 cm) slices. Arrange the cucumber slices on a serving platter. Pipe the spread in small tops on top of the cucumber slices. Cut the smoked salmon into strips. Fold it up and place on top of the cream cheese. Garnish with a small sprigs of dill. Lobsters are a creature with a delicate taste and texture. So by poaching it in butter, you get the purest and cleanest lobster taste ever. Making it Sous Vide you are getting the perfect texture to your liking. The temperature is controlling the texture. Well time is too, but by poaching the lobster for 45-60 minutes, temperature is the controlling factor. Different cooks choose different poaching temperature. Thomas Keller calls for 139℉ (59℃) and Modernist Cuisine calls for 115℉ (46℃). I decided to go with 135℉ (57℃) and the result was fantastic, I got a tender and somewhat firm juicy lobster. This one is a winner. Set you sous vide to 135℉ (57℃). Place the lobster tails and butter in a vacuum sealer bag, sealing with the moist setting. Place the bag in the water bath, making sure that the lobster is fully submerged. Set timer for 50 minutes. Remove lobster tails from the bag, discarding the liquid, when it is time to serve your benedict. Melt the butter in a sauce pan over very low heat. Let simmer gently until the foam rises to the top of the melted butter. Once the butter stops spluttering, and no more foam seems to be rising to the surface, remove from heat and skim off the foam with a spoon. The foam is the milk solids from the butter. Ladle the butterfat into another saucepan leaving the water and residue behind. You can also pour the butterfat through some cheesecloth. Keep the butterfat warm. The clarified butter should be about 172℉ (77℃). Add the rest of the ingredients, except cayenne, in a blender. Blend until foaming. With the blender running add ⅓ of the butter in a slow steady stream, yes it will splatter. Once it emulsifies, turn the blender speed up to high and add the remaining butter. Season with salt and pepper and blend for another second. Sprinkle the cayenne on top when serving. 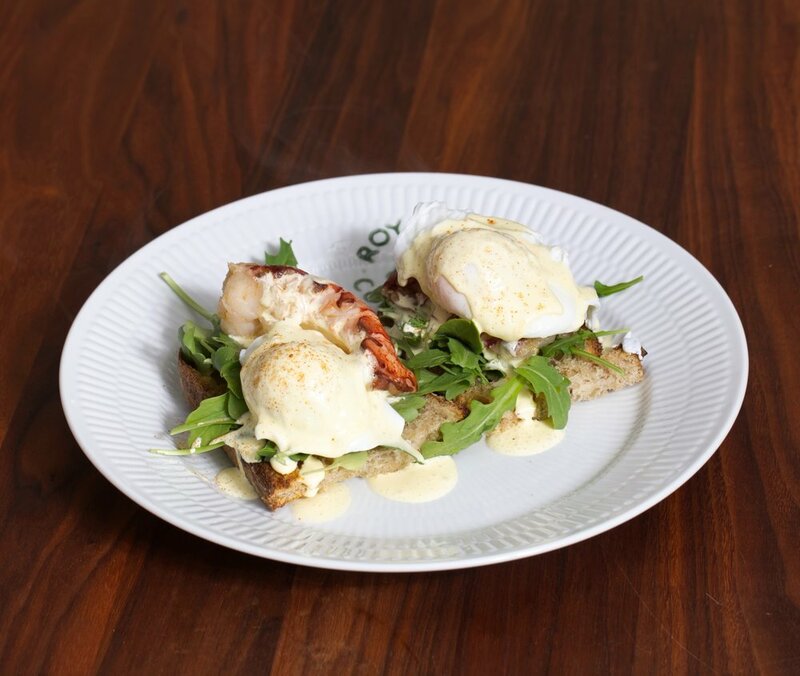 Toast the bread, place a handfull arugula on it, placing a lobster tail and a poached egg on top. Ladle a spoonful warm hollandaise over, sprinkling with some cayenne. We have something with risotto and scallops in our house. It is a great luxury you normally will get at a restaurant. But you can easily make it at home. Just make sure to have every ingredients prepared and ready to go. By making it at home you are sure to get the risotto perfectly al dente, creamy, and seasoned to your tasting. This risotto can be an appetizer or a full meal. parsley, minced for a sprinkle on top. Heat butter in a sauté pan, sauté the onion until translucent. Add rice and cook while stirring, until all the rice are coated and they start to crackle. Pour in the wine, and let it simmer lightly until the wine is absorbed. Start adding a small ladleful hot stock at a time, letting the rice absorb the liquid before adding more. You want the risotto to cook for a low simmer, stirring constantly. Cook the risotto for about 25 minutes, until the rice are al dente, and they have a little bite, without being crunchy. Add lemon juice, lemon zest and parmesan and cook till its melted making the risotto nice and creamy. Season the risotto with salt and pepper to taste. Heat a skillet over high heat, add oil and butter. When the fat begins to brown and smoke sear the scallops for 1½ minutes on each side. The scallops should have a ¼-inch golden crust on each side, while being translucent in the center. Place the scallops on top of the risotto and sprinkle with more lemon zest and parsley. I have to come clean. I love pasta - Big Time! And I do not discriminate, I love all pasta equally. I love the taste, texture and how it is soaking up sauce. I do crave pasta. When we have pasta for dinner, I have to plate it up in serving sizes, no family style pasta in my house. We went to BJ's Restaurant and Brewhouse as one of the first places when we just moved to the US. And I fell in love with their chardonnay shrimp pasta. And whenever we went back there this was my go-to meal. But at one point BJ's discontinued this yummy pasta dish, and I had to try to make my own version. Cook the bacon. I cooked it almost crispy in the microwave oven, and then diced it. Set aside, letting it drain on a paper towel lined plate. Melt butter and a splash of olive oil in a sauté pan, sauté the shallot until translucent. Add garlic and shrimp and sauté until the shrimp start to take color. Add wine, cream, rosemary, bacon and cook for 3-4 minutes till the shrimp is tender. Add cooked spaghetti, diced tomatoes, parmesan, lime juice and parsley, and let it heat through for about a minute. Serve immediately sprinkled with some parsley and red pepper flakes.